When Vladislav Mamyshev-Monroe started to conquer the Soviet and Russian art world at the end of the 1980s, Evgenij Kozlov's famous studio "Russkoee Polee" (1989-1991) was the creative hub for the art scene in Leningrad / St. Petersburg, and the young artist was a frequent visitor. Kozlov immediately recognized Mamyshev's extraordinary talent and supported him in every possible way. In his studio, Kozlov organised the first photo sessions with Vladislav Mamyshev and created performances with him. At “Russkoee Polee”, Vladislav Mamyshev painted two works for Kozlov’s collection “2x3m”. He also lived and worked there when Evgenij Kozlov was away. Both artists were often seen together at exhibitions and happenings. 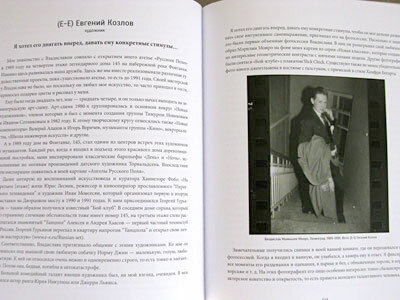 Kozlov would take video recordings during these encounters, and together with Yury Lesnik's videos they provide the earliest film documentation on Mamyshev. This intense period of artistic encouragement ended when Kozlov had to close “Russkoee Polee” in 1991, but there can be no doubt that it helped Vladislav Mamyshev to gain confidence in pursuing his very individual way as an artist and actor. No 158 from the series "E-E Classic (НЛО - UFO)"
in front of Evgenij Kozlov's painting "Love for the Cosmos"
At Russkoee Polee ("The Russian Field"), (E-E) Evgenij Kozlov arranged numerous photo sessions with Vladislav Mamyshev posing as Marilyn Monroe – actually Mamyshev’s first photo sessions. They took place in front of Kozlov's paintings from the series “New Classicals”, in his bedroom and in the so-called “Lenin’s room”, decorated with Lenin memorabilia. Kozlov reworked the pictures in his photo collages, but also gave them to Mamyshev, who used them for his own works. Those eight proof sheets presented here assemble film strips with 187 pictures, selected from a total of six different films with 208 pictures. Other proof sheets with single photos of Vladislav Mamyshev-Monroe have not been included. With his collection "2x3m" Evgenij Kozlov wanted to give artists the opportunity to realize a work in this unusually large format. He challenged their artistic creativity providing them with canvas, oil, space and his own companionship. Vladislav Mamyshev-Monroe contributed to the collection with two large paintings in 1990. "Отравилась? Нет, затравили! Евгению Козлову" / “Self poisoned? No, poisoned!!! To Evgenij Kozlov" was the first; the second was "Это не любовь. Объединению Германии посв. русскому-у полю-ю 1990” / “This is not Love. Dedicated to the German Unification.To Russkoee Polee" 1990". These two paintings were probably the largest Mamshev ever painted. As part of the "Collection 2x3m", they were exhibited at the first exhibition on Palace Bridge and "Tenderness and Virility. I love California", both Leningrad 1990, and in Nantes, France (1991). A picture of Vladislav Mamyshev at Russkoee Polee with his painting "Self poisoned? No, poisoned!!!" and Evgenij Kozlov's painting "The great Le-yeh-nin" was published on the cover of a book called "Der Wilde Osten" ("The Wild East"), Edition Stemmle (1991), thus symbolizing Eastern Europe after the collapse the Soviet regime. Both works sadly disappeared from Kozlov's "2x3m" collection in the 1990s when they were stored in St. Petersburg, waiting to join the rest of the collection then already assembled in Berlin. Video "Смерть Монро" / "The Death of Monroe"
At the beginning of 1991, when (E-E) Evgenij Kozlov spent several weeks in Germany, he gave Vladislav Mamyshev the keys to his studio “Russkoee Polee”. Vladislav Mamyshev was happy with this generous proposition and invited film director Andrius Venclova to film the video clip "Смерть Монро / The Death of Monroe" in two rooms of the studio. Kozlov's paintings "The Energy and Strength of Men", "I Love You-You" and "The Great Le-yeh-nin" were also used for the setting. In the video we see Vladislav Mamshev-Monroe passionately singing "Happy birthday Mr. President" to a friend who wears a J.F. Kennedy mask. Always looking for the best props, Mamyshev created Monroe’s death scene lying on top of rolled up canvases from Evgenij Kozlov's collection "2x3m". The plot of the video is a "living picture" or live-enactment of a painting by Vladislav Mamyshev from 1990, also from the collection "2x3m": "Отравилась? Нет, затравили! Евгению Козлову" / "Self poisoned? No, poisoned!!! To Evgenij Kozlov". It can be seen hanging on the wall just before the camera pans to the death scene. For the exhibtion "Geopolitika" at the Museum of Ethnography, Leningrad / S. Petersburg (1991), (E-E) Evgenij Kozlov conceived the idea of a "GeoPhotoPolitical WEEapon" which was to be operated by Vladislav Mamshev-Monroe on the day of the opening, February 18, exactly between 16.30 and 16.45. Kozlov wrote a manifesto for Mamyshev's performance, stating that this "unique Geopolitical WEEapon corresponds to the tasks and ideas of the Geopolitical exhibition and the present political situation in the world". In Kozlov's video from the opening we can see Mamshev sitting inside the "GeoPhotoPolitical WEEapon" – a wooden construction created in the shape of a pistol – "shooting" at visitors with Kozlov's camera. For the finissage of the exhibition, these "Geopolitical Portraits" were to be assembled by Kozlov on the walls of the Museum of Ethnography "with GeoPhotoPolitical materials made in a GeoPhotoPolitcal way from the GeoPhotopolitical WEEapon" . However, the film seems to have been lost. Other works by Vladislav Mamyshev-Monroe at the "Geopolitika" exhibition included a series of re-painted posters from his famous "Politbureau" series (a gift to Evgenij Kozlov originally displayed at Kozlov's studio "Russkoee Polee"), as well as а "Vacuum blister": a "lethal weapon" demonstrated in Mamyshev's "Monrologia" video (Pirate television). The videos "Death of Monroe", filmed at Russkoee Polee a few weeks prior to the exhibition, and "Monrologia" were presented on TV screens. "Члены Политбюро / Members of the Politburo"
Vladislav Mamyshev-Monroe is well-known for his reworked posters of "Members of the Politburo". Official posters of the upper class of the Soviet nomenklatura were printed for a mass public in large editions and sold at bookstores for a nominal price. Whether they were actually bought by the target audience remains a matter for speculation, but in the case of Mamyshev they proved to greatly stimulate his artistic imagination. In 1990, he offered ten of these posters with a dedication to "beloved artist Evgenij Kozlov", and it is highly likely that these were his first embellished Politburo posters. Exhibition "Умелые ручки • Crafty Hands"
Yuris Lesnik's Pirate Television (Пиратское Телевидение), Leningrad, 1991. Vladislav Mamyshev-Monroe presents: "Pirate Television: The DISCO PARTY Music Show"
Filmed by (E-E) Evgenij Kozlov at the opening of the exhibition “Неоакадемизм / Neoacademism” ), Leningrad, 1991. Russkoee Polee, studio Evgenij Kozlov, 1989 / 1990. In the background Evgenij Kozlov's painting "Love for the Earth".